Have you thought about a student survey? 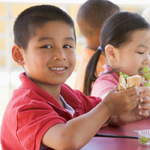 Use this resource for students to conduct a school lunch survey to gather ideas and then present recommendations for improving their school district's lunch offerings. Appropriate for grades 6-8.